The next time some know-it-all moralist blames any number of social ills on violent video games or action films, ask them if they’d rather kids stick to the classics. 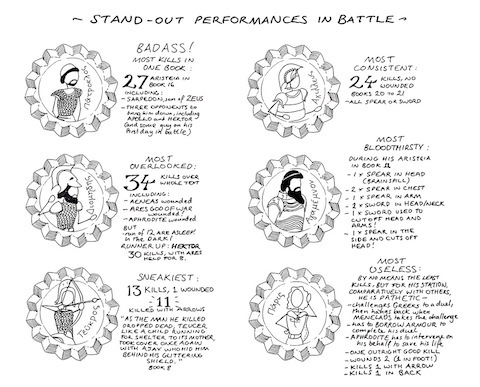 When they invariably reply in the affirmative, you can smugly direct their attention to Greek Myth Comix’s astonishing infographic detailing the multitude of gruesome killings in the Iliad. Homer’s epic unflinchingly describes, for example, in graphic detail, the death of Lycon, who in Book 16 has a sword thrust through his neck: “nothing held but a piece of skin, and from that, Lycon’s head dangled down.” And if you’ve held on to your lunch, you may be interested to know the grisly circumstances of the other two candidates for “grimmest death.” Just below, see a section of the comic celebrating “stand out performances in battle.” Can Zack Snyder’s King Leonidas match kills with Homer’s Achilles? Only one way to find out…. The Iliad graphic is great fun—as well as a succinct way to render modern scolds speechless—but Greek Myth Comix doesn’t stop there… Oh no! 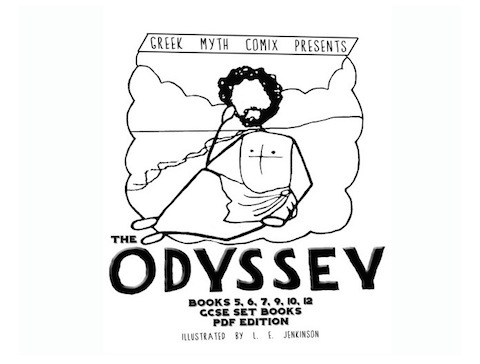 Fans of Homer’s Odyssey will not be disappointed; Books 5-7, and much of 9, 10, and 12 also get the “comix” treatment. The artwork is admittedly crude, but the text comes from a much more authoritative source than 300, no disrespect to Frank Miller. Lauren Jenkinson is a “Classical Civilisation and Literature teacher, writer and, apparently, artist,” and her online adaptations are intended primarily to help students pass their GCSE (OCR), the British secondary exams whose nearest equivalent in the States might perhaps be the SATs. But Greek Myth Comix won’t only appeal to struggling students in the British Isles. Educators will find much to love here, as will lovers of mythology in general. Online access to the site is free, and you can purchase copies of the comix in PDF—either individually, in bulk, or in poster-size resolution. 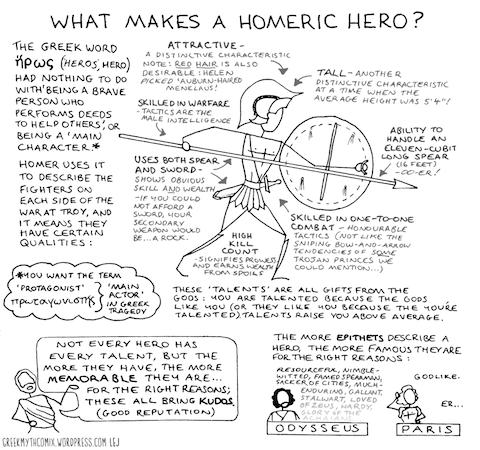 The site’s full archive has other goodies like the above, “What Makes a Homeric Hero?” And with such recent updates, no doubt Greek Myth Comix has much more in store for those struggling to enjoy or understand Homer’s bloody-minded epics, and those who simply love their myths in comic form as well as ancient lyric. I made one of these for Uni two years ago and put it on the internet – I’m so annoyed!